KHARTOUM, SUDAN (ANS) — Churches in Sudan have called for democracy, human rights and equal citizenship in statements delivered at a Christian service held on April 14 at the sit-ins staged around the Sudan Armed Forces (SAF) and National Intelligence and Security Services (NISS) headquarters in Khartoum. Christian Solidarity Worldwide (CSW) reported Church leaders representing the Sudanese Evangelical Presbyterian Church (SEPC), the Baptist Church and the Sudanese Church of Christ were present at the demonstrations to participate in the call for change and reform in Sudan. Christians have participated in the demonstrations since December 2018 and some have also been killed, including Christian student and activist Nasheed Saeed, who died in the cross fire between military officers and special security police on April 8. However, due to the repression churches and church leaders have experienced over the last five years, an official church position on the protests had not been adopted. Of the church leaders present at the demonstrations, a number had been arrested, detained or had experienced restrictions on their places of worship since 2011. On April 11, the day after the coup, Christians stood arm in arm to protect Muslim protestors from the military while they participated in Friday prayers at the sit in. Sudan is currently being led by a Military Transitional Council (MTC) which took power from President al Bashir on April 11. The MTC has engaged in dialogue with representatives of the Sudanese Professionals Association (SPA). However, no formal decisions or agreements have been made in terms of the composition of a civilian led transitional council, which is one of the key demands of the protesters. Under the state of emergency, the military has suspended the constitution, and parliament has been dismissed. Moreover, the MTC has announced that President al Bashir will not be transferred to the International Criminal Court (ICC), where he is wanted for atrocity crimes committed in Darfur, but will face trial in Sudan. The MTC is also considering the arrest of other leading members of the National Congress Party (NCP). 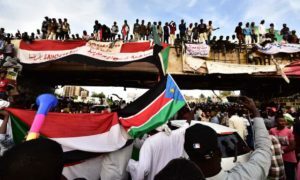 On April 15, a joint letter by Sudanese, African and international civil society organisations called for the protection of the democratic will of the people of Sudan and supported demands for an urgent transition to a civilian government. He added: “We call on the recently installed Military Transitional Council to transfer power to a civilian-led transitional council that represents the diverse interests of the Sudanese people, enjoys the support of the demonstrators, and can implement the necessary reforms through meaningful, inclusive dialogue and consultations.